July 3, 2018. 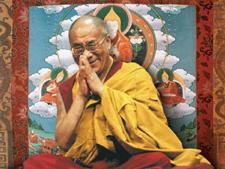 Leh, J&K, India – After an early departure Delhi Airport this morning, His Holiness the Dalai Lama took a flight to Leh. He was given a ceremonial welcome on arrival with an ornamental umbrella, horns and drums. 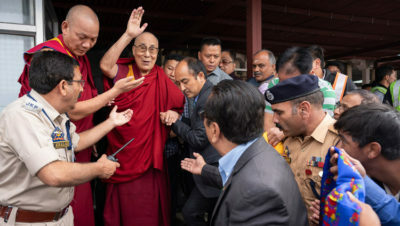 He was greeted by former Ganden Throneholder Rizong Rinpoche, Drikung Chetsang Rinpoche and Thiksey Rinpoche, as well as other Lamas. Local officials and representatives of various organizations were also there to pay their respects, including MP Thubten Tsewang and Leh MLA Rigzin Jora, in addition to numerous members of the public. As His Holiness’s car pulled slowly away from the airport, the road was lined by thousands of Ladakhis and Tibetans, monastics and lay people, old and young, including hundreds of school children in uniform. It was as if the entire local population had turned out to greet His Holiness, eager smiles on their faces, scarves, sticks of incense and flowers in their hands. Reaching Shewatsel Phodrang His Holiness was welcomed once more by Ganden Trisur, Rizong Rinpoche, Drikung Chetsang Rinpoche, Thiksey Rinpoche, Taklung Matrul, Thuksey Rinpoche and so forth. Tea and sweet rice were served. “I am very happy to be here once more,” His Holiness told the gathering, speaking first in Tibetan and then in English. “I seem to be physically fit and if that continues I hope to spend some time here, avoiding the monsoon on the plains. You people of Ladakh have a special bond with me based on your faith and loving-kindness, of which I am very appreciative. “I’ve been coming here for more than 50 years. To begin with Ladakh was quite under-developed. That’s now changed and we can see all sorts of material progress. In the monasteries too, compared to 50 years ago, the quality of study has grown significantly. Indeed, I recently met members of the Tawang Foundation who have plans to transform all the monasteries from here to Tawang into serious centres of learning.